Each month, I usually run a giveaway here with a cookbook I think my readers will enjoy. This month, I have a copy of Norwegian Cakes and Cookies - a pretty cookbook that I hope will inspire you to cook up a few desserts that you've never made before. 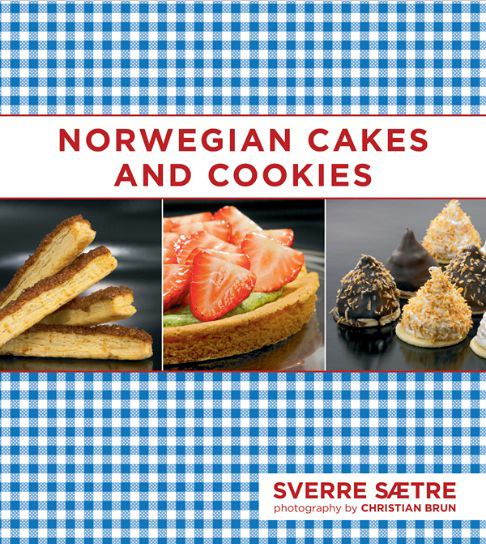 The book offers a beautiful repertoire of dessert recipes - many based on traditional Norwegian desserts with a modern twist. Acclaimed pastry chef Sverre Saetre shares some of his favourite recipes alongside some gorgeous food photos. Some standout recipes I can't wait to try are his Marzipan Cake with Strawberries, Raspberry Jam with Lychee and his Rhubarb Soup with Cinnamon and Sour Cream. It's often easy to get into a bit of kitchen routine and to make the same desserts over and over again. This book is the perfect opportunity to step out of your comfort zone - whatever it may be - and try something new! To win your very own copy of this cookbook, simply let me know which dessert you've made most recently. The contest ends on April 12th 2012, at midnight. The winner will be drawn at random and you must be a Canadian or American resident to enter. Good luck and I look forward to hearing from you! As a foodie with a first degree in Scandinavian Studies I would simply love this cookbook! The dessert I made most recently was a homemade strawberry pudding with coconut whipped cream. Yum! The book looks very interesting! I would love to have it in my kitchen. I just made lemon squares today. Last week I made a banana cake with cream cheese frosting. Last desert I made: vanilla cake with passionfruit curd and vanilla-rhum swiss meringue buttercream... for my own babyshower! I wouldn't leave the fun of making the cake to anyone else. I made oatmeal cookies with raisins, chocolate chips, and walnuts! This cookbook sounds pretty cool! Thanks for the giveaway! regaThe last dessert I made was a potato pie with almonds and chocolate.. I wouldn't have tried it actually, but our local a la daring bakers group chose it as this months' challenge ! i made strawberry tiramisu this morning, i can't wait to try a piece after lunch! i adore cookbooks and would love to have this in my collection, you're right about getting into a dessert slump! My most recently dessert I made was vanilla ice cream. The last dessert I made was dulce de leche cupcakes for a friend who gave up chocolate for lent! I am way too addicted to dulce de leche. I have Norwegian friends who always cook and bring us savoury food like brown cheese, reindeer stroganoff (yum!) and lots of gorgeous seafood. I'd love to see the recipes inside this book! Great giveaway - this cookbook looks awesome! The most recent dessert I made was cupcakes for my boyfriend's birthday based on the drink the 'old fashioned' - orange cake with whisky-bitters-orange zest buttercream. I have a coconut layer cake baking as I type this. I made strawberry shortcakes for my sister's birthday. My grandmother always made a Vanilla Chiffon cake for each of us on our birthdays, so I made her cake yesterday for a family gatherings. 9 eggs! 3 heaping tsps of baking soda! Baked in a angel food cake pan. Unusual, old fashioned recipe but the cake is absolutely amazing. I would love this cookbook,since my husband is Norwegian! The last dessert I made was pretty cupcakes for my son's Birthday! I love cookbooks!!! Always looking for new recipes to try. The latest dessert I made was Sweet Potato Flan. I visited Finland last fall, and this cookbook sounds awesome! I made some peppermint brownies on Saturday for my in-laws. I'll be making more for my husband tomorrow night. Norweigan food is so underrated! I'd love a cookbook to make it more often! My last dessert was actually cinnamon sugar soft pretzels for a church function. They're always a huge hit because they're not AS sweet as the other desserts. Thanks for hosting the giveaways! I actually saw this at B&N recently and mentally filed it away to check it out later. It sounds awesome. I'm currently trying to clear out the freezer to make room for upcoming cooking/freezing marathons, so the last thing I made was a couple of loaves of peach bread. Nom. coconut cupcakes...and I don't bake enough. My mom and I made cupcakes yesterday! I almost cried when I saw the cookbook. My Norwegian grandmother's desserts were heavenly. Her cookies were famous in the town we lived in. She's been gone nearly 20 years and my siblings and I still talk about her skills in the kitchen. Funny enough, the last dessert I made were her now world famous sugar cookies, thanks to a cousin who made them in Japan. We have friends who get angry if we don't make them every Christmas. They are out of this world. I would love to own this cookbook. The last dessert I made was a cheesecake. Ooh this book looks interesting!! Would love to have this cookbook. The last dessert I made was a Lemon Drizzle Cake from the book "Best Kept Secrets of the Women's Institute." I made New York Times chocolate chip cookies for some mentors and colleagues at work:) Thanks! I made some Jacque Torres Chocolate chip cookies recently for my mentors an co-workers. Thanks! I recently tried something new and is now my favorite: alfajores!! I made some chocolate cayenne cookies. I made pancakes! Thanks great giveaway! We made SunKake...and the kids all helped and had so much fun! Thanks for visiting my blog! I'm loving yours, and extra-excited that I'm in time for this giveaway. I love Beatrice Ojakangas' book (if you know it) and so I'm in love with Scandinavian baking. My most recent dessert--I made the lemon birthday cake from the flour bakery cookbook for my younger son, who just turned two! I made pistachio cookies :-). Would love to try some Norwegian desserts, I am not familiar with Norwegian food much. What an interesting looking cookbook. The last dessert I made was a batch of lime cookies. They were great! I made almond cookie and sweet egg bread.Thanks for the great giveaway! I can't wait to try are his Marzipan Cake with Strawberries, Raspberry Jam with Lychee and his Rhubarb Soup with Cinnamon and Sour Cream Send gifts to Pakistan from UK.